DISTINGUISHED PEOPLE INTERVIEWED BY A. SLOPER.—COLONEL W. F. CODY. "Say, come any morning before the show begins," Buffalo Bill had said, "and you shall try any of my buck-jumpers you like." A. SLOPER said he would with pleasure, and chooses an early date. (1). Before starting he had looked long and earnestly at Jubilee's copy-book. "Shall I?" he murmured. "The like in childhood's hours stood me in good stead to ward off the straight strokes of the master hand. No!" cried he, throwing it from him, "it shall never be said that the Friend of Man resorted to artifice."—(2). 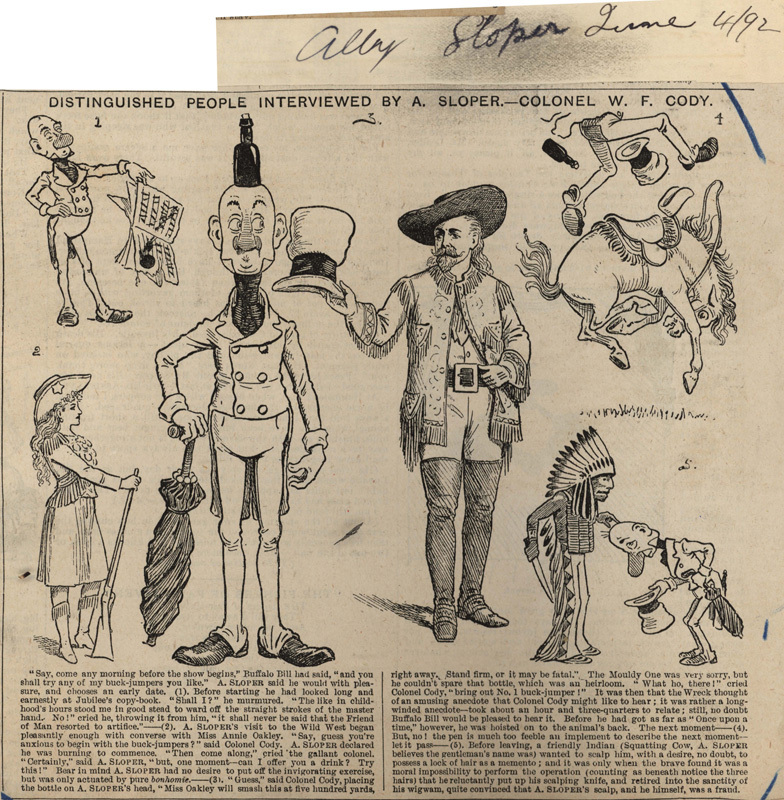 A. SLOPER'S visit to the Wild West began pleasantly enough with converse with Miss Annie Oakley. "Say, guess you're anxious to begin with the buck-jumpers?" said Colonel Cody. A. SLOPER declared he was burning to commence. "Then come along," cried the gallant colonel. "Certainly," said A. SLOPER, "but, one moment—can I offer you a drink? Try this!" Bear in mind A. SLOPER had no desire to put off the invigorating exercise, but was only actuated by pure bonhomie.—(3). "Guess," said Colonel Cody, placing the bottle on A. SLOPER'S head, "Miss Oakley will smash this at five hundred yards, right away. Stand firm, or it may be fatal." The Mouldy One was very sorry, but he couldn't spare that bottle, which was an heirloom. "What ho, there!" cried Colonel Cody, "bring out No. 1 buck-jumper!" It was then that the Wreck thought of an amusing anecdote that Colonel Cody might like to hear; it was rather a long-winded anecdote—took about an hour and three-quarters to relate; still, no doubt Buffalo Bill would be pleased to hear it. Before he had got as far as "Once upon a time," however, he was hoisted on to the animal's back. The next moment——(4). But, no! the pen is much too feeble an implement to describe the next moment—let it pass——(5). Before leaving, a friendly Indian (Squatting Cow, A. SLOPER believes the gentleman's name was) wanted to scalp him, with a desire, no doubt, to possess a lock of hair as a memento; and it was only when the brave found it was a moral impossibility to perform the operation (counting as beneath notice the three hairs) that he reluctantly put up his scalping knife, and retired into the sanctity of his wigwam, quite convinced that A. SLOPER'S scalp, and he himself, was a fraud.